I believe I'll start every blog post with a little French quip going forward. Don't I sound fancy and oh-so-cultured? I'm not. In fact, the only foreign language that was offered in my teeny weenie Central Arkansas hometown was Spanish. Our teacher spent every class popping Sudafed and letting us watch educational films, like The Princess Bride and Clueless. In other words, my Spanish speaking capabilities don't go a whole lot further than my French. 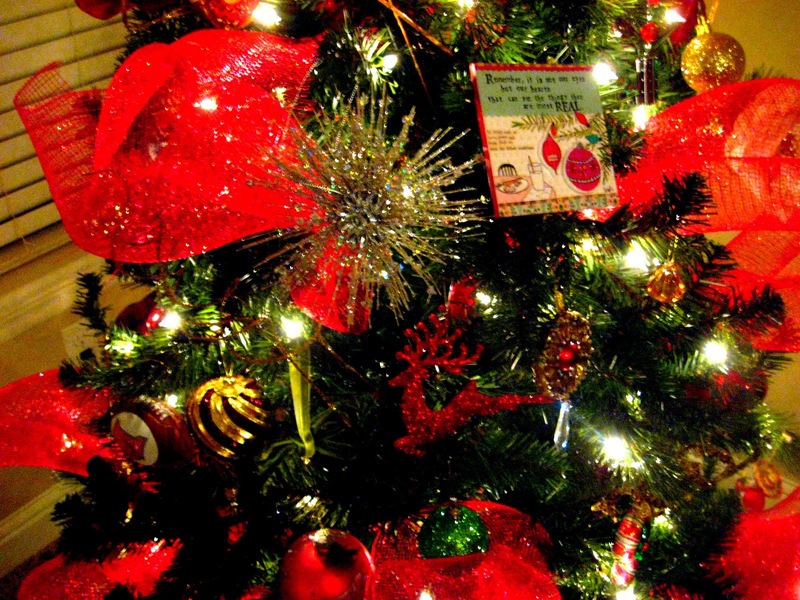 Well, now that we're officially off topic, let's talk about Christmas stuff! Oh me, I do LOVE some Christmas decor. 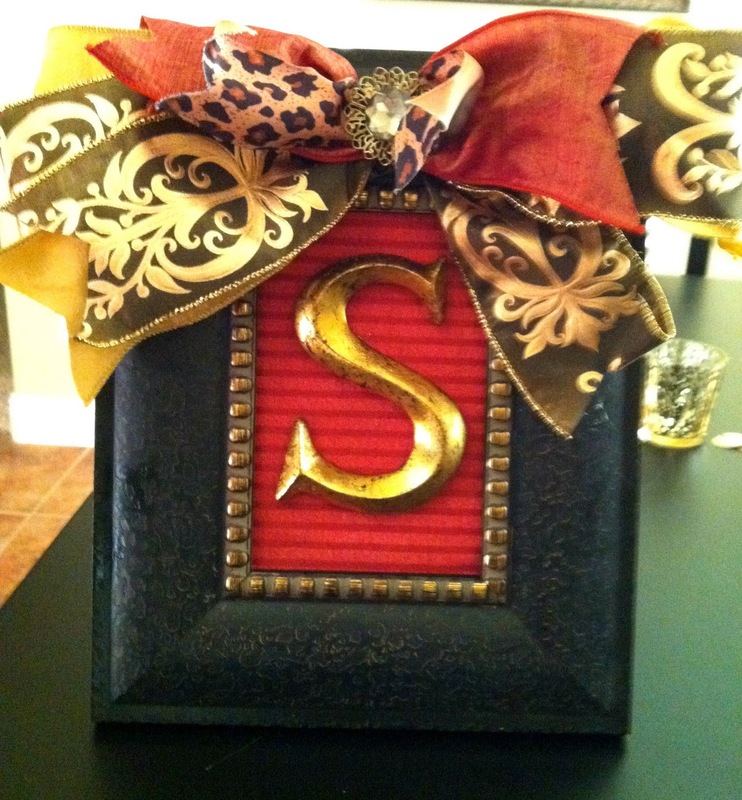 I believe my tendencies to over-decorate come straight from my being very southern and very dramatic. You see, we southern ladies don't feel a room is complete unless it's decorated within an inch of its life. Ornate and slightly overdone...that's me! I did two trees this year - one in the dining room and one in the living room. 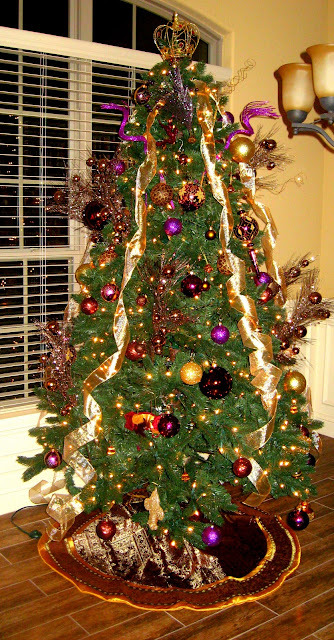 Here's Tree #1, which I did in a royal plum, gold and chocolate brown theme! 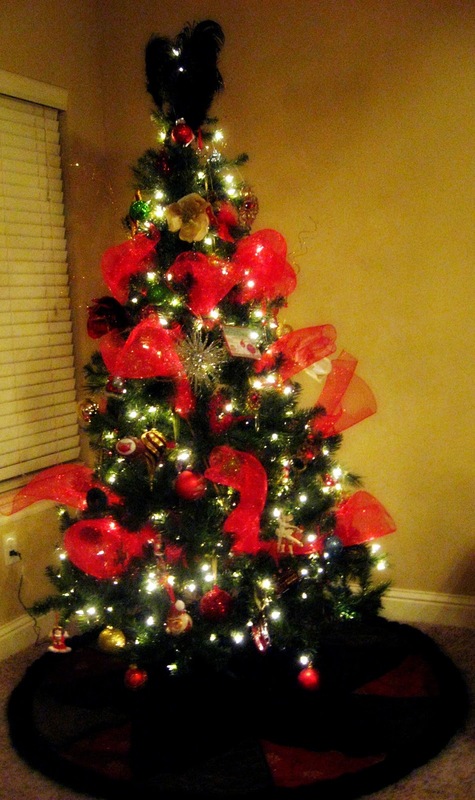 Our second tree, I decorated in a more traditional red and black theme. I used TONS of deco mesh in bright cherry red and topped the tree with a feather spray. 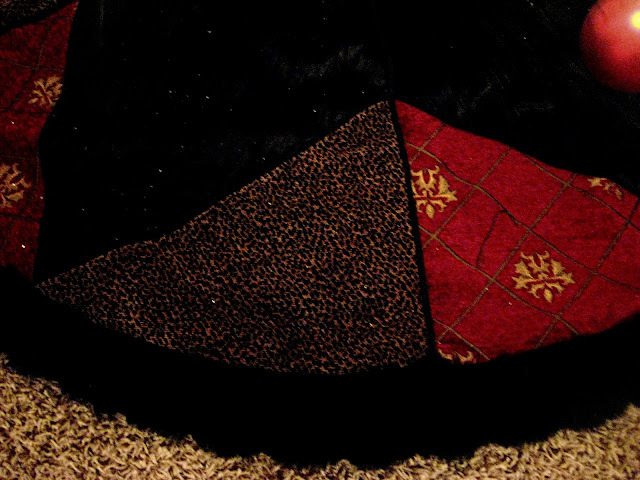 I bought this fur trimmed tree skirt at Hobby Lobby in 2009 and still love it. 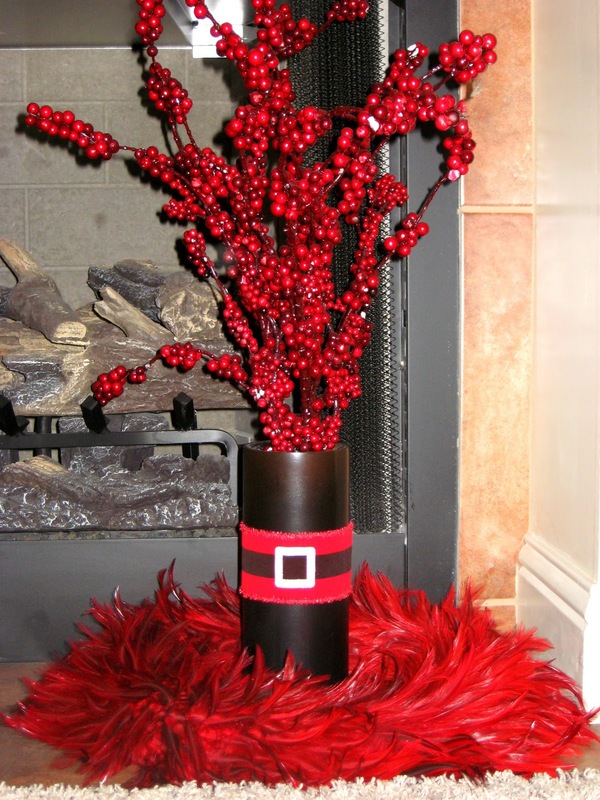 The fireplace features a cranberry spray, nested inside a feather wreath. The wreath came from Home Interiors last year. It was a gift from my mom! I added the Santa belt to the spray holder. 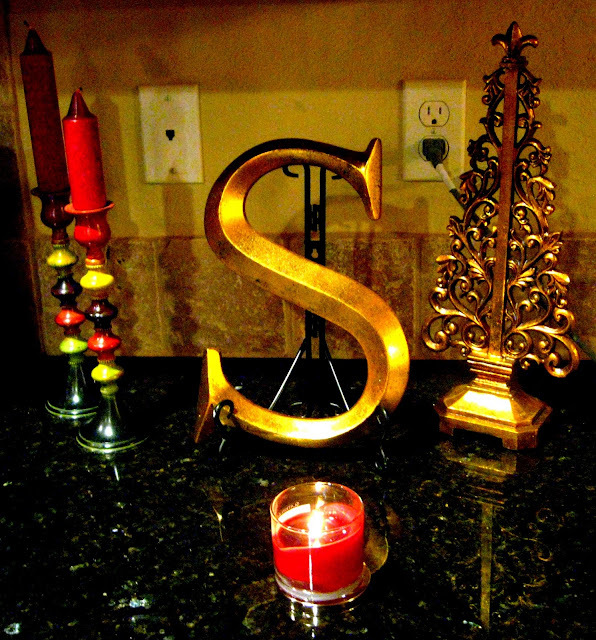 I decorated the kitchen with a big, golden "S" initial for our last name, a gold Christmas tree cardholder and 2 candlesticks in holiday colors. 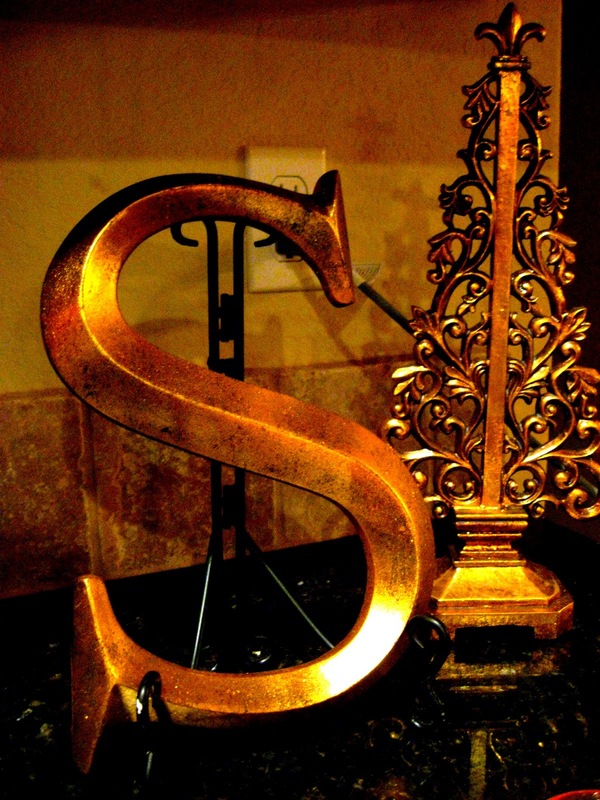 I purchased this gold frame as an accent piece for the dining room. 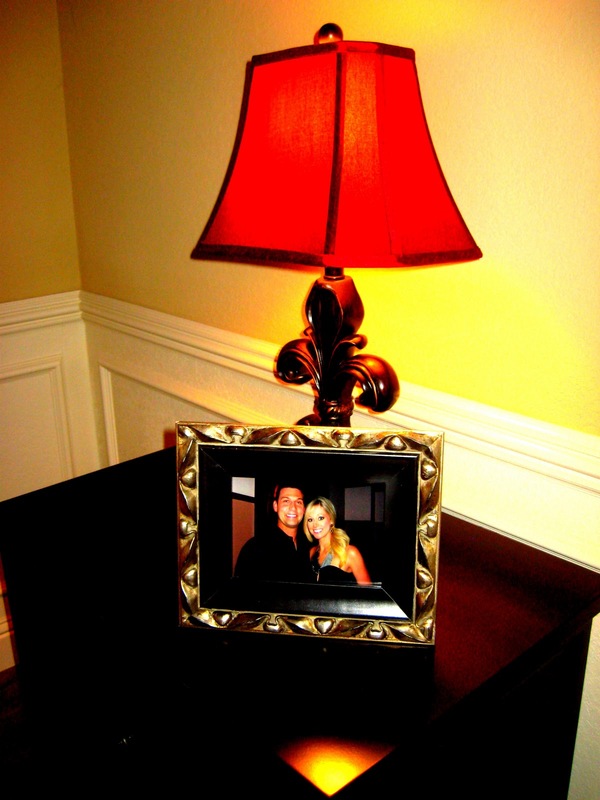 I love how it looks against the red fleur de lis lamp! Decorative balls from Hobby Lobby sit on the countertop in the kitchen. I made this frame from supplies I purchased at Hobby Lobby! So inexpensive and very easy! Next week, I'll have two tutorials up. One will be showcasing how to make animal print decoupaged Christmas ornaments, like I made for our Royal tree. The other will showcase how to make faux Christmas trees from foam cones and upholstery fabric for a unique centerpiece! P.S. 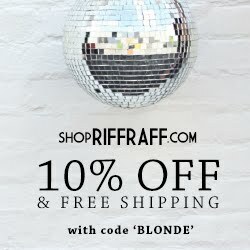 - Check out my guest post for NWA Motherlode where I feature a holiday gift guide for the fabulous woman! Pass it along to your hubbies for good Christmas ideas ; ) NWA Motherlode is the hands-down BEST blog and online magazine for moms in Northwest Arkansas! 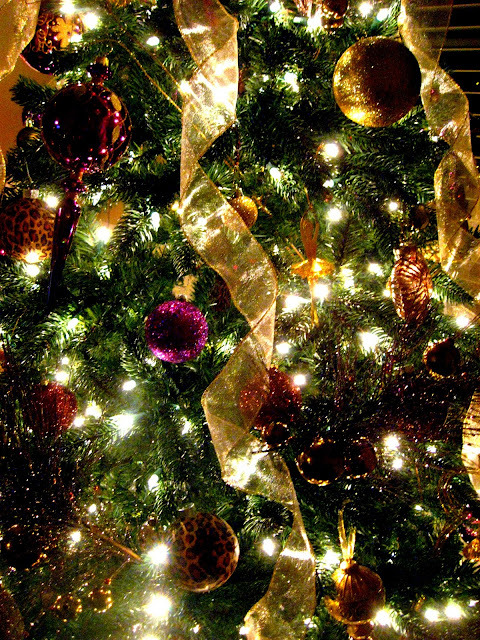 I LOVE that crown on top of the tree! I tried to get mom to get one this year, but she wen't with another one from Hobby Lobby instead! And I love that fur vest! I need one now! You are so stinkin cute!!! your trees look so pretty. I love your taste! and that vest????? MUST HAVE! super cute outfit, your hair looks fab too! I love the purple, gold & brown tree! It is so very royal and splendiferous! Happy Holidays! Another holiday house decorating post to remind me of what a slacker I am!! 2 trees...and we haven't even gotten our 1. I love all your decorations. So cute!! 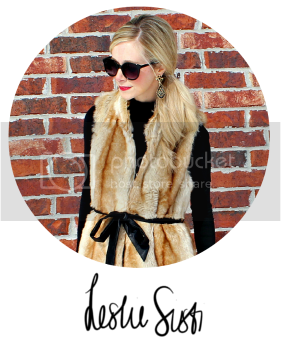 Love the fur vest, definitely going to buy me one now, knowing how adorable it could look! love your cutesy decor! You are just too cute! Your trees are beautiful! I am not brave enough to branch out into non-traditional Christmas colors but your combos look great! I LOVE both trees! They look so beautiful. It looks like you spent so much time decorating them. And I love how you weaved in ribbon! Don't forget to check out my Michael Kors giveaway! It ends tonight! I love all the gold accents! 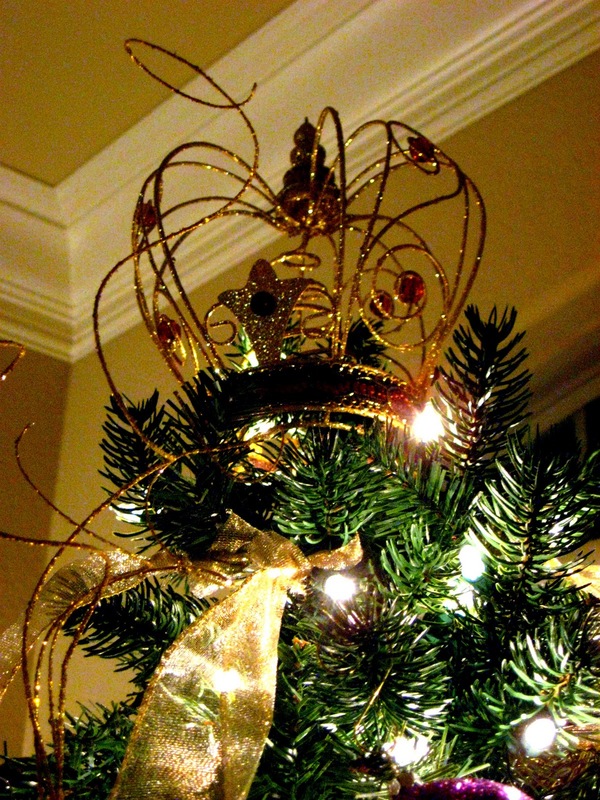 Looks very regal, just like your crown tree topper. You look so cute and your home is amazingly decorated!! Absolutely stunning for the holidays! 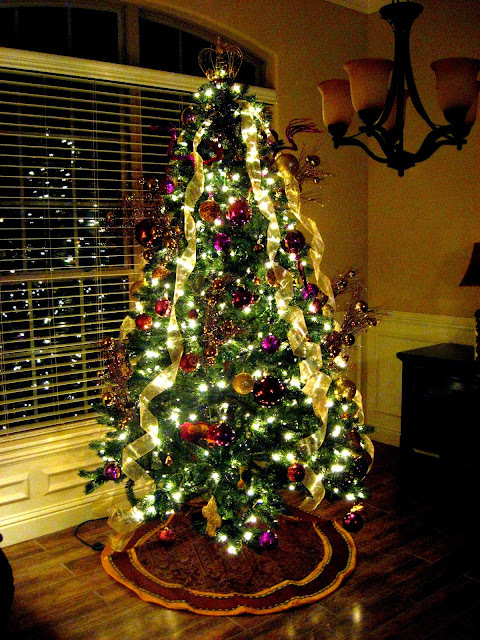 LOVE both of your trees! They are very cute and very YOU! I absolutely ADORE that crown topper!! Non Christmas related, I'm having hair envy!! 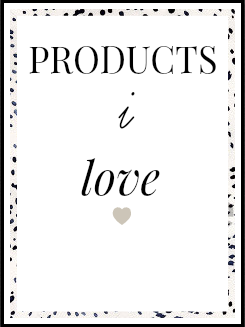 What do you use??? I need that crown!!!! i am obsessed with crowns and have a tattoo on my ribs of a crown!!! AHH!! so jealous!!! Looove the decorative balls! So cute! Your trees are beautiful! I love seeing how other people decorate for the holidays.